We’re mixing up our Annual HarFest Bash a bit for 2018 and it will be the best way to ring in the fall and celebrate the harvest season on Friday, October 26th from 7-midnight! 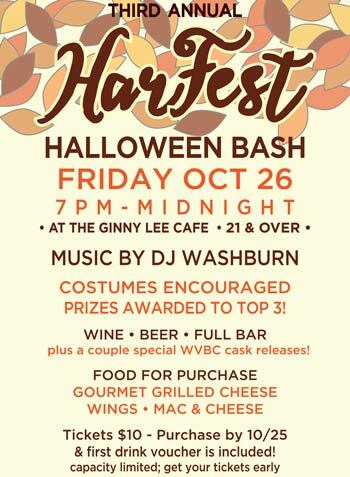 This celebration will just be for our 21+ fans with Washburn Entertainment to DJ, and since the bash will be held indoors at the Ginny Lee Cafe weather is no issue. Costumes and dancing are not only welcome but encouraged! There will be a costume contest, so bring your A game! Winners of the costume contest will be announced around 10:30pm – you must be there to win and you must be there before that to enter. 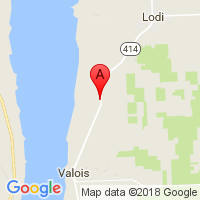 We will have Wagner Vineyards wines, Wagner Valley Brewing Co brews, and full bar for cocktails. Wagner Valley Brewing Co will have a specialty cask just for the event – a limited batch that you won’t want to miss. The cafe will have a special menu of gourmet grilled cheese sandwiches available for purchase – just the right thing for late October! Tickets are $10/person and when you purchase before the end of the day on Oct 25th your first drink is included. AZ, CA, CO, DC, DE, FL, GA, IA, ID, IL, IN, KS, MA, MD, ME, MN, MO, MT, NC, NE, NH, NY, OH, OK, OR, PA, RI, SC, SD, TN, TX, VA, VT, WA, WI, and WY. Need some help deciphering the IRF scale? Find some info here to make sure you're ordering the right sweetness for your taste. We are closed on Christmas, Thanksgiving & New Year’s Day. The Ginny Lee Cafe has different seasonal hours listed separately on their website. Must be 21 to purchase alcoholic beverages. Please drink responsibly. If you have any difficulty accessing information on this website, please call the winery at 1-866-924-6378. Sign up for our e-news and stay up to date on events, sales, and more!